I’m tied into a rope at least 250 days a year so I feel I have a good sense on what works and what doesn’t. 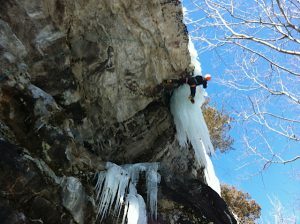 Generally speaking a skinny rope will be lighter, handle better, have a lower impact force (which is great for climbing above marginal gear – like ice screws), but be less durable then a larger diameter rope. The main complain I hear over and over is that skinny cords, ” just don’t last.” This shouldn’t be a surprise and often it is best to reserve those small diameter ropes for redpoint attempts, alpine routes, or higher end climbs where weight really matters. Well, meet the 9.1 Icon from BlueWater. For me, this is the most durable rope in it’s class. I have done my best to beat this rope up and it is still going strong and I can’t say that about a lot of skinny ropes I have used over the years. The tightly braided sheath gives great durability without making the rope feel like a cable. So, if you’re looking for a new skinny single rope I don’t think you will be disappointed with the 9.1 Icon!